Not sleeping through the night at 6-12 months old? 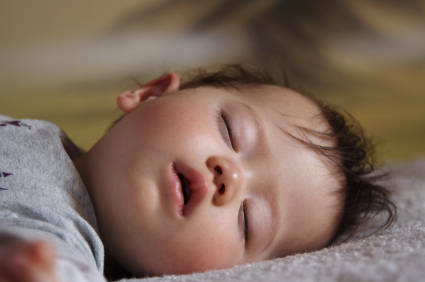 Let's find out why your baby wakes up and how to reduce night awakenings maximally. Without crying it out. From 6 months onward, you can expect fewer night feedings. A healthy, well-feeding baby stocks up well during the day and can have an 8-12 hour stretch without or with just one feed in between. Notice the word "can" ? Indeed, at this age it is physically and mentally quite possible for your baby. Yours still wakes and feeds more than once? Sleep disturbers like teething, separation anxiety and illnesses typically play and may cause frequent awakenings. Also she may still need to learn to self soothe back to sleep after a brief awake moment. As long as that's not the case, there will be more awakenings. And then there are nightly feedings. Is she waking up to feed, or feeding because she wakes up? Once past 6 months old, it's a thin line between feeding out of necessity or out of habit, or for comfort. Know that it's not your baby playing tricks on you out of ill will. What typically happens is that a truly necessary feed becomes a habit – before you realize that it's not really necessary anymore. Feeding at about the same time each night creates a true hunger feeling – whether needing the food still or not. That true hunger feeling can wake up your baby, wanting to feed. Similarly, the need for comfort and reassurance - for example during separation anxiety phases - is a legit reason for your little one to wake and maybe want a feed. Luckily there are gentle techniques to find out why she's waking up and how to help break through this cycle. Before anything else, you'll always need the basics in place as described in the sleeping through section. Self soothing will be especially important so do work on that well, refer to the 6-12 months self soothing tips. Food is an important factor for healthy sleep. Since your baby will now have started solids and will eat and drink more and more different things, keep a close eye on what you offer. Above all, avoid over-feeding, and especially do not stuff before bedtime. It is a myth that baby sleeps better with a full stomach. On the contrary her sleep will be less restful, and she may wake more easily. But you need to strike the right balance of course. You don't want her to wake up hungry either so do offer sufficient quantities, but nicely spread throughout the day. Finally, avoid over-tiredness thanks to a regular schedule and good naps. More on that on the next page. If your baby keeps waking frequently at night and you can't figure out why or how to break the cycle, you may find the action plan in my e-book Overcome Frequent Waking most helpful.